If Microsoft Bing looks a trifle different this morning, it's because the search engine's design team says it wants to make finding safe, dependable casual games and sleuthing for mainstream video game cheats and tips easier. I took the refinements for a test-drive, and after poking around the new interface, I can say they've pretty much nailed the former, but flubbed the latter. Let's start with the good then, which involves getting casual games in front of casual gamers more or less effortlessly. To that end, the company says it worked with Microsoft Games to offer around 100 of the most popular casual games "safely from right within Bing." How's it work? Just "Search, Click, Play," writes Bing senior vice president Yusuf Mehdi, and presto, casual-game-o. 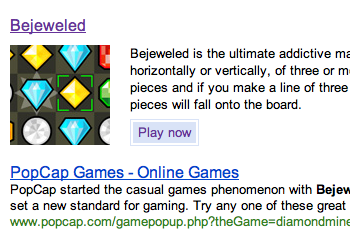 Sure enough, I typed 'Bejeweled' into Bing's search box and--after scanning past the obligatory BigFish, GameHouse, and Iwon ads--there it was, a thumbnail buttressed with a gameplay description and a simple 'Play now' button. Tap that, and PopCap's famous gem-alignment game loads in a respectably sized window, framed on the left by additional Bing game links sortable by genre. Type 'Blackjack' and you get Blackjack. 'Zuma's Revenge' and up comes PopCap's "ball-blasting" puzzler. There's also Luxor, Bubble Town, Slingo, Bookworm, Mahjong Match, and more. I don't count 100--more like one dozen--in the featured search slides that appear when you sort by genre, but scanning down the page through a "favorites" collage, I spotted dozens more, from Plants vs. Zombies to Granny in Paradise. Typing those in manually conjured them just as easily. There's even a Facebook angle. Sign into your Facebook account through a bar running along the top of each game, and you can see your friends' game feeds while you play or share your high score on a leaderboard. Why play games on Bing natively instead of linking through to an established destination? Microsoft says it's to keep thing simple, but also to reassure that the games you're clicking on aren't malware. If you load Bing, then hover over the Entertainment sub-link, you'll now see three options, the third being "Find game reviews and walkthroughs." Click that, and...well, it looks like Microsoft hasn't fully sorted its interface yet, since you're dropped back into the casual 'Games' tab instead of the intended 'Video Games' one. One more click then, and you're at Video Games, where each game gets its own slide containing links to the game's official site, a Bing video trailer, miscellaneous game info, and links to walkthroughs and cheats. Unfortunately the data sources for Bing's game tips are cripplingly limited. Batman: Arkham Asylum's 'takedown' and 'video' guides both link to IGN. So do all four of Super Mario Galaxy 2's walkthroughs and cheats. Red Dead Redemption defers its video cheats to G4TV, but the cheat FAQs? You guessed it: IGN. According to Bing's 'data provided by' note at the bottom of the page, the data populating its new video games interface is piped in from IGN and G4 only. Where's GameSpot's arguably superior (and hugely popular) GameFAQs? 1UP's MyCheats? What about Cheat Code Central? UGO's Super Cheats? GamesRadar's Cheats & Guides? Why partner with just one or two sites (of debatable quality) instead of roping in the rest? Hey Bing, a solid B for effort, but an F for agnosticism, and when it comes to credible, useful searching, the latter's the only A that matters.